Microwave ovens have become one of the most popular kitchen appliances over the past few decades because of their compact size and cooking versatility. 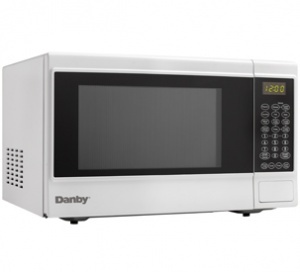 This top-rated countertop model from Danby is one of the most popular out there as it comes with 10 separate power levels and can put out 1,100 watts of pure cooking power. It provides 1.4 cubic feet (36 liters) of cooking and reheating space and features simple one-touch cooking for 11 of the most popular uses. The elegant black and white exterior enables this fashionable microwave to easily fit in with any style of existing décor. The unit is simple to program and monitor with the easy-to-read LED timer and clock combination and ultra-modern electronic controls. It also comes with an added safety feature in the innovative child-proof lock and boasts a 12-month warranty on parts and labor.